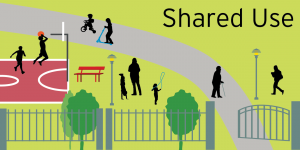 Although shared use is most often used as a strategy to increase physical activity opportunities on school grounds, other government agencies, community- and faith-based organizations are successfully implementing other types of shared use arrangements. Examples include using public or private property for growing food, opening kitchen facilities for cooking classes, and creating recreational opportunities with non-traditional partners such as utility districts. We developed this primer to explain the complexity of public land ownership and some of the related legal and policy issues that may arise when partnering with public entities to create opportunities for physical recreation. This guide provides tools to help access public land for growing food, including common types of agreements that govern the relationship between food-growing groups and public entities, and common provisions in agreements, such as liability. in partnership with the North Carolina Division of Public Health, we developed this fact sheet to highlight how faith-based organizations can play an important role in improving the health and well-being of their neighbors by opening up their facilities and programs.